Weighty Matters: POM Wonderful said whatnow? From the, "they said whatnow?" file comes the latest from POM Wonderful. You know POM - they're the makers of the pomegranate juice that their marketers want you to believe is seemingly miraculous in its ability to confer health. 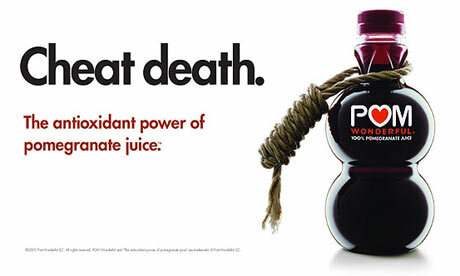 Well last week POM Wonderful announced that they were suing the Federal Trade Commission on the grounds that the FTC's insistence on having a minimum of two clinical, human trials and pre-market Food and Drug Administration approval for certain claims is a breach of their first amendment right to free speech. Apparently POM Wonderful believes that FTC shouldn't be able to set the bar on what constitutes, "competent and reliable scientific evidence". "The new FTC rules essentially bar POM from discussing or disclosing the results of its research and the benefits of its products"
Yes. How dare the FTC suggest that the results of research matter in making a health claim? With that as a requirement how is POM ever to promote its own "research".